1. I seize this opportunity to remind you of the encouragement and commitment of President Muhammadu Buhari to provide the resources and enabling environment in the discharge of our duties which he elucidated in his remarks during the recently launched Armed Forces and Remembrance Day Emblem Appeal Fund 2019. I therefore wish to thank Mr President for his continuous support and encouragement and to also commend the efforts, resilience and sacrifices made by all of us including those that have paid the supreme sacrifice to ensure that Nigeria remains indivisible and secured. However, the recent sporadic skirmishes from the BHTs should be seen as a desperate effort from a highly degraded and expiring adversary striving to maintain its notoriety and portray itself as formidable and cohesive; something that is completely false. It is merely the “last kicks of a dying horse”. We have achieved great successes over the BHTs. Thus, absolute and conclusive victory is just inches away. Let us therefore not relent in our gallant efforts and draw back the hands of the clock. 2. The NA is not known for cowardly behaviour. We have contained several incursions and several security challenges bedevilling our dear country within the last 3 years and now would not be an exception. Consequently, any soldier that turns away in the face of enemy incursion would be appropriately sanctioned and made to face Field Court Martial in accordance with our extant laws. As you are all aware; the consequences could be grave. Do not be complacent by being contented with repelling their attacks, instead, go after them, capture them, and when absolutely necessary, be decisive with the daring ones. Some women and children have been held captive, you are therefore to ensure that adequate rules of engagement are employed to extricate them before any offensive action. 3. 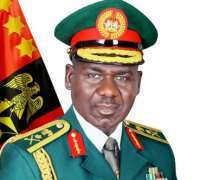 As your COAS, I have never relented in my pursuits of ensuring that your welfare is adequately catered for. To this end, I have directed that your allowances are paid regularly as and when due. I have also directed that troops’ rotation be carried out as scheduled. As soldiers in battle, I am aware of the effects of battle fatigue. Consequently, I have also directed that passes be issued to officers and soldiers that require same to visit their families. Recall that I approved the special promotion of more than 5000 troops for gallantry. Be rest assured that the process is continuous. Your kitting has also been improved drastically. Special uniform allowance was paid a month ago directly into your individual accounts. Through the various intervention programmes to the NA by the government, the stock of arms and ammunition has greatly improved. Just recently, the NA took delivery of large consignment of high calibre weapons and ammunition. These are already being injected into the theatre. I therefore urge you to make use of them judiciously and ensure they are effectively used against the terrorists and not taken away by them. 4. In a bid to swell their depleting ranks, the BHT have continued with their false teachings and instilling fake ideologies on the youths of the North East. To curb that, I have directed the Department of Civil Military Affairs in collaboration with the Department of NA Chaplain/Imam Services to immediately provide counter narratives through the community resilience and stabilization campaign programme. I have also established the Nigerian Army Cyber Warfare Command to amongst others prevent online terrorism, online radicalisation as well as online recruitment. To this end, do not let the false propaganda and narratives being spread by the rag-tagged terrorists sway your thoughts and actions about our dear country. We should continue to stand and fight even when the going gets tough and the ignorant and enemies of the state choose to castigate us. You are to also note that many people have returned back to their towns, villages and communities that were hitherto abandoned, and the terrorists have taken advantage of the large population in the towns and villages to infiltrate into them. You must therefore be extra vigilant and establish good civil military relations with the locals. You are to use this to acquire actionable intelligence to prevent any attack on the communities as well as your positions. 5. At this juncture, let me thank Nigerians from all walks of life for their support, prayers, encouragement and goodwill towards the Nigerian Army in the service of our fatherland. The Nigerian Army is your Army. I wish to also convey my appreciation to you all, the troops, for your selfless service towards the defence of our dear country. Your courage and gallant demonstration of our core values of sacrifice and selflessness amidst the daunting challenges being confronted daily in the theatre speak volumes about your professionalism and patriotism to the Nigerian State. I implore you to continue to uphold the trust the nation has placed on your noble shoulders for the maintenance of the sanctity of her territorial integrity. We must all remain steadfast. We must see this victory to a conclusive end. We must justify our oath of allegiance to our fatherland and dedication to her sovereignty. I once again salute your courage and wish you the best successes out there.